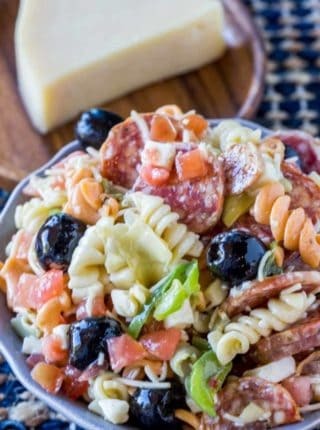 Easy Pasta Salad made with mozzarella, black olives, cherry tomatoes, and bell peppers in a creamy Italian dressing is the PERFECT side dish to bring to a potluck or picnic! 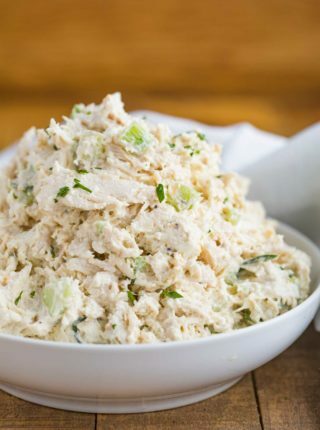 We’re always working on perfecting our favorite side dish recipes, and right now we’re prepping to make Macaroni Salad, Crab Salad, Best EVER Baked Beans and Cole Slaw. 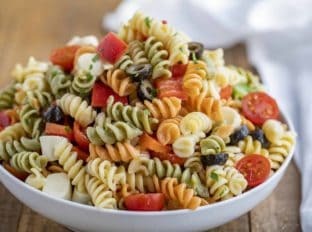 Easy Pasta Salad is a simple side dish made with mozzarella cheese, olives, pasta, and vegetables in a homemade dressing. This is a meatless version of my Italian Antipasto Pasta Salad, but just as creamy and filling. If you want to add meat to this classic Italian pasta salad, try salami, prosciutto, or pepperoni. 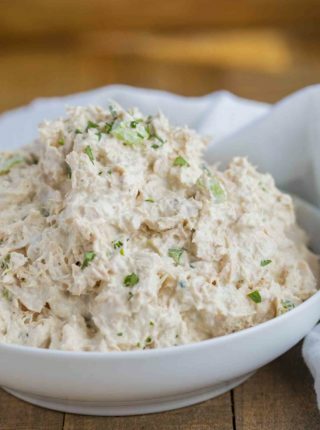 This recipe takes a total time of 10 minutes to throw together, but I recommend refrigerating for at least an hour before serving. The refrigeration time gives the flavors a chance to come together, plus this dish is best served cold. This is my go-to pasta salad recipe when I have a potluck to go to, and beats store-bought every time! If you buy a pre-made dressing it is almost as easy too! CAN YOU MAKE PASTA SALAD AHEAD? 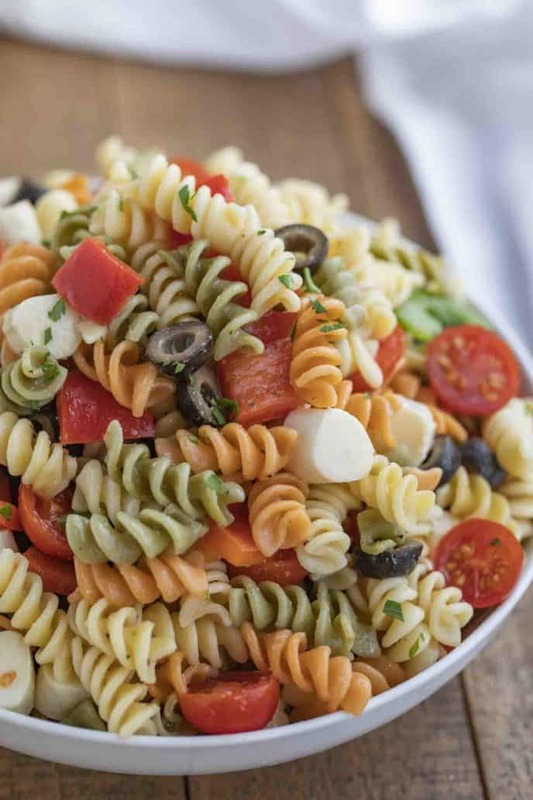 This Italian pasta salad recipe is perfect to make-ahead because it tastes best after it’s been refrigerated. I’ll make this cold pasta salad the day before or in the morning when I’m serving this at night. Reserve some extra dressing just in case the salad dries out, but it should be fine if it’s sealed tightly. I would not make this more than 24 hours ahead, to make sure it’s the best quality possible when you serve it. HOW LONG IS PASTA SALAD GOOD FOR? Pasta salad will last for 3-4 days, when tightly sealed in an airtight container in the refrigerator. 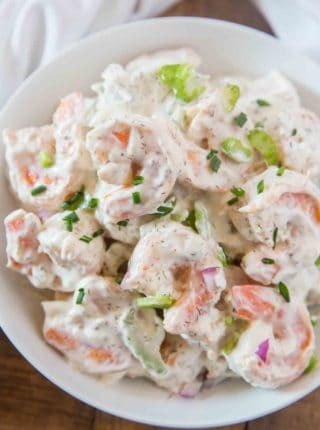 I don’t recommend freezing this recipe because the mayonnaise in the dressing may separate and not defrost well and the vegetables will not hold up well to the freezing and thawing. WHAT OTHER ADD-INS CAN I PUT IN PASTA SALAD? Top with fresh parsley before serving for presentation. You can also make this recipe with penne pasta, or whatever type of pasta you have in your pantry. I avoid using spaghetti noodles because it’s easier to serve this with smaller pasta, but I have seen pasta salad made with it before. The tri-color pasta in this recipe adds a nice color to the presentation of the dish. Add a dash of balsamic vinegar or red wine vinegar for some flavor variation. Make this Italian pasta salad spicy with some red pepper flakes, diced red onions, or spicy peppers. When pre-cooking your pasta, make sure you only cook it in a large pot to al dente, so you don’t end up with mushy pasta. Rinse the pasta with cold water to keep it from cooking further. You can use store-bought Italian dressing, but this homemade dressing will have a lot more flavor. Add feta cheese to make this a greek pasta salad. Chop your veggies to be about the same size, which will make the pasta salad look more uniform and each part will be bite-sized. 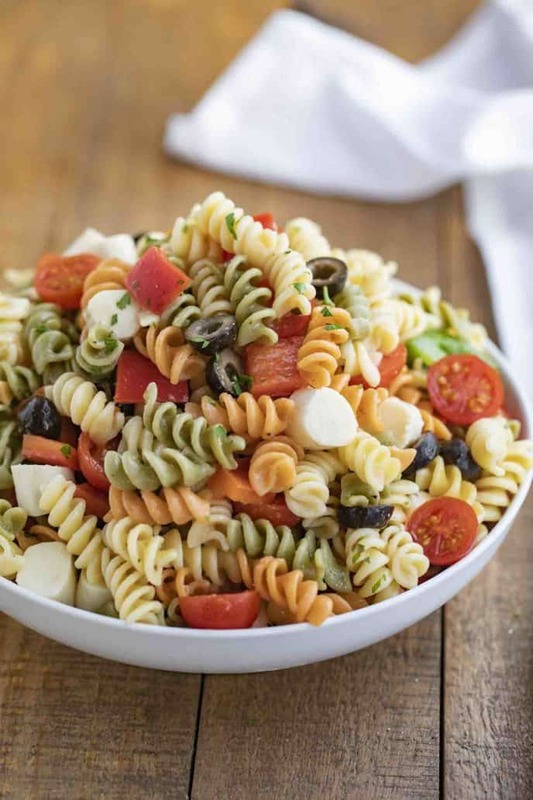 Add more antipasto ingredients to this pasta salad recipe like sun dried tomatoes, artichokes, cucumber, Roma tomatoes, or aged provolone. Add some grated parmesan to the top, or serve extra on the side. 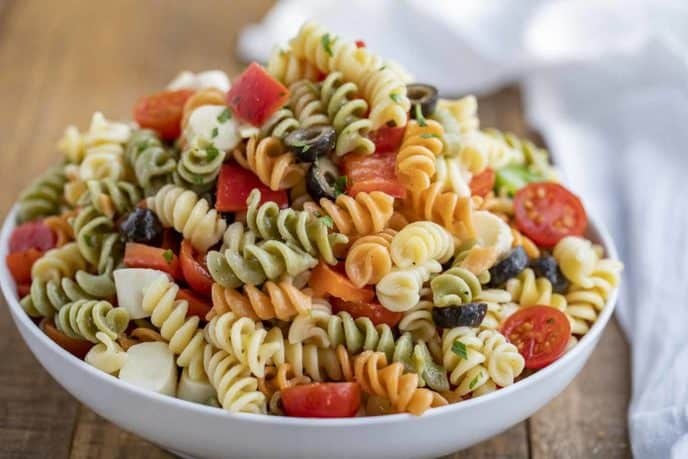 The Italian dressing has enough seasoning, but you can add some fresh flavor to this Italian pasta salad with herbs like basil, dill, or minced chives. In a large bowl add the pasta, mozzarella cheese, tomatoes, black olives, green bell pepper and dressing and toss gently, then refrigerate at least an hour before serving. hello there,i just want to say that your recipes are fantastic………give more something like arabic recipes,,,,,,for lamb,,chicken,,and rice dishes. So glad you’re enjoying the recipes. It was so easy to make and it saves time .I enyoyed it thank you. You’re welcome! So glad you enjoyed it!